It is, as one has come to expect, thorough and thoughtful. But there is a very surprising omission. The issue as he states is the fares are too high and that if fares were reduced then usage would increase which would increase revenue. But nowhere in the article can I find the term “fares elasticity” or any discussion about what effect changes in fares have had – or might have – in quantified terms. As it happens, this has been one of the things that, as a transportation economist, I spent a lot of time working on. It is not at all simple and straightforward – few things in life are. Perhaps not quite as difficult to model as the Higgs Boson – but close – but at least we know that fares elasticity actually exists. The jury is still out on the boson. And the fares elasticity for BC Ferries has indeed been the subject of a recent, thorough and objective study by InterVistas for the Ferry Commisioner (that’s a pdf file you might want to save for future reference). 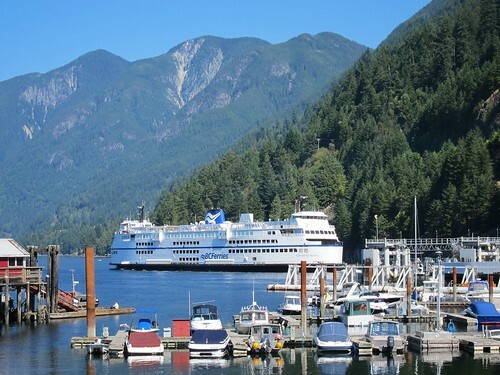 Ferry demand depends on the price of ferry services, with a price elasticity of roughly -0.28. Ferry demand depends on GDP growth (or reduction) with an elasticity of roughly +0.21. No discernable impact of population on ferry demand is apparent, at least with this data set. The seasonality effect in the total ferry traffic is strong and significant. It dominates the model.Seasonality alone explains 99% of the variation in the quarterly data. At this stage, I am not going to get into the analysis, except to make a couple of observations. All economic forecasts are based on the caveat “other things being equal” and in real life they never are. Secondly, the consultants were looking at the potential revenue from fare increases i.e how much usage is lost when the price goes up. Elasticities cannot be assumed to be symmetrical. For an order of magnitude estimates, they are not bad, but people react differently to a price cut than a price increase. That is due to the law of diminishing marginal returns – buying twice as much of something doesn’t make you twice as happy even if you got a two for one deal. The second thing you bought was not as rewarding to you as the first and thus not worth as much. But even so, for an opinion piece in the Sun, and the ease of finding this information, Palmer’s questions can indeed be answered. Now, at this stage I am not going to get into the complexities of the ferry routes and what ought to happen. My point at the moment is the simple one: Palmer should have found this report and ought to have referenced it. But maybe, like me, he does not have the time at present to read the entire thing, or have the energy to actually work out for the new ferry CEO what the answers to these sums look like. But clearly they fall into the category of “known unknowns” right now. Maybe, when I have a bit more time I can return to this subject, but I am surprised that I have not got more response on the ferry issue in general.